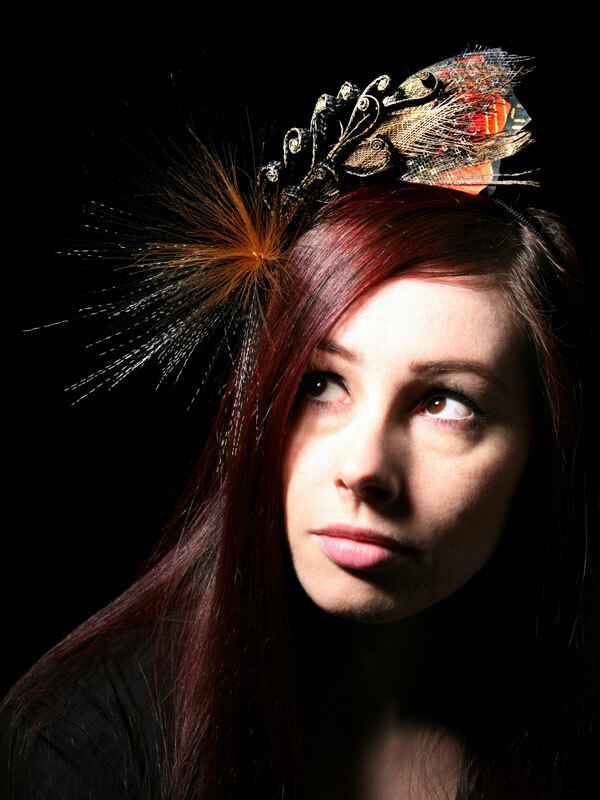 Bridget Bailey has been making her colourful, dramatic millinery for the last 30 years. Many are inspired by nature – from feathers to pea pods and flowers – and all combine her love of colour and texture with an interest in elaborate, sculptural forms. She says, ‘The big hats have been left behind and replaced with delicate, quirky headpieces which are a bit cheeky and a bit frivolous’. 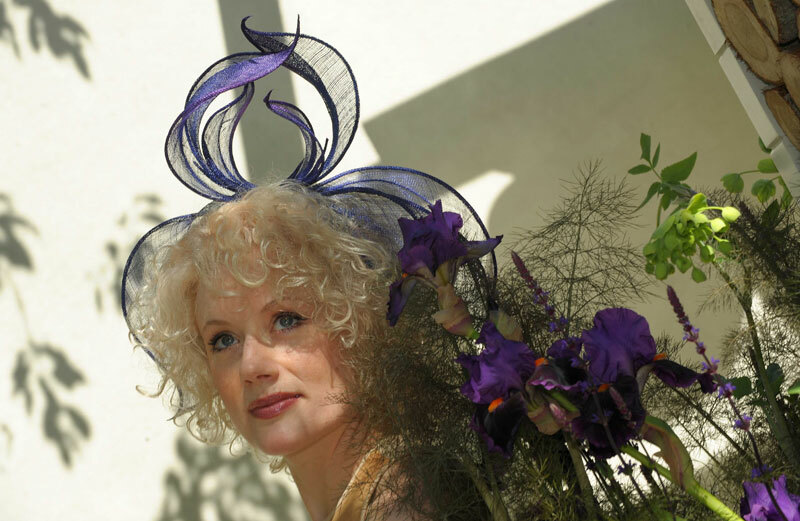 What made you first decide to specialise in millinery? While I was at college (Bailey did her MA in textiles at Birmingham University) I spent a lot of time experimenting with intricate pleated materials and when I left I went to visit Jean Muir to see what she would make of it. She said to me, ‘Make me some hats’, and so that’s what I did. It was completely out of the blue and I was really thrown in at the deep end but it just worked for me and I’ve never really looked back. So how did you set about becoming a professional milliner? I started as a freelance making hats for Jean Muir and trained with milliner Rose Cary before setting up the company Bailey Tomlin in 1989. At Bailey Tomlin we mass-produced the hats; the bases were blocked by a different firm and we handmade the trims. During the boom time this formula worked really well and we sold our hats all over the world, but about five years ago things changed and price constraints meant that we now make much fewer, but much more special hats, often specially commissioned by clients for shows or particular events. After working for so long in wholesale, it’s lovely to be doing something different all the time. What attracts you to making hats? I like making something for the head – you don’t sit on hats, or stand on them or have to dry clean them, so you can be much more frivolous than with other items of clothing. I love the idea of being able to make something a bit eccentric or quirky that can, for example, cheer up a lovely classic dress. 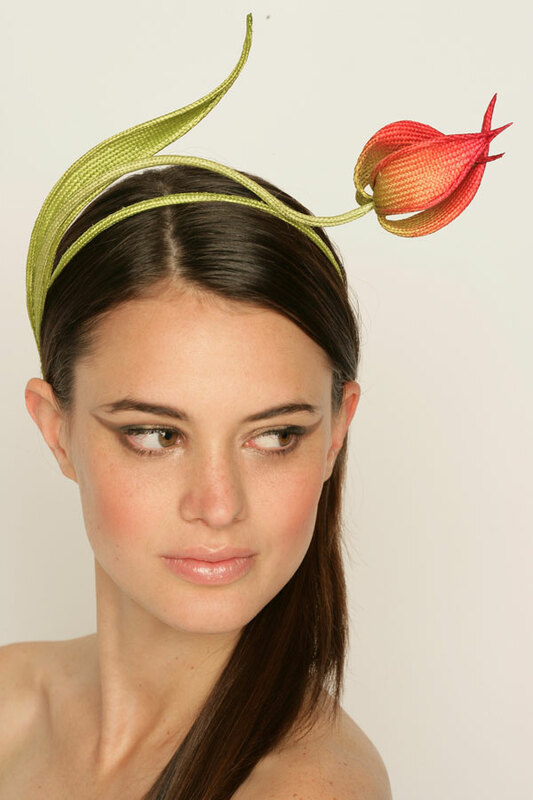 I’ve just made an Iris Headpiece for Chelsea Flower Show and I really enjoyed that as it didn’t have to be too functional and so I could flex a bit of creative muscle and make something that was a bit of a talking point. How would you describe your millinery? I work quite a lot with colour – I’m always dying things. I think my work is a mixture of colour and texture – reflecting my background in textiles I suppose. I like to add texture to a fabric by carving lines into it or embossing it or hiding wire into to it to create quite a sculptural, 3D feel. I use quite simple, traditional materials but I like to work them in a new way so they look different, using them more inventively and being a bit ingenious to disguise them. I would like to be known as someone who can bring something fresh to a project or a material and make you look twice. How do you display your millinery? I see them more and more as sculptures or exotic specimens – a bit like those collected by Victorian naturalists – and so I sometimes display them under big glass domes. My pieces are great things to wear, but it’s also nice to display them when they’re not being worn, rather than leaving them in a box on top of the wardrobe. I like the idea of showing them on the mantelpiece or in a dome all the time. Nature is my main source of inspiration. I find what goes on in the natural world so extraordinary – not just the pretty, pretty side of nature but also the more sinister, unexpected side. For example, I recently learnt that the spots on birds’ eggs are caused by a lack of calcium, a fact that really made me think about the scientific magic of nature. I’m also a keen vegetable grower and have an allotment so I’ve got quite a down to earth approach to nature. Sometimes the materials I’m working with suggest things. For example, I made an edge for quite a traditional hat using padded green and white straw and realised that it was crying out to be turned into a spring onion – you have to go where the materials take you sometimes. Do you find that changing fashions effect/restrict your designs? I’m a bit in my own world and I don’t really follow trends, especially as I now make specially commissioned work that doesn’t have to fit in with a certain look. This means that my work is very rich as I don’t have to chop and change with each season but can just go on doing my own thing. In fact my work is just a constant evolution of the ideas that have interested me over the last 30 years. Are you interested in working in other areas of fashion or craft? 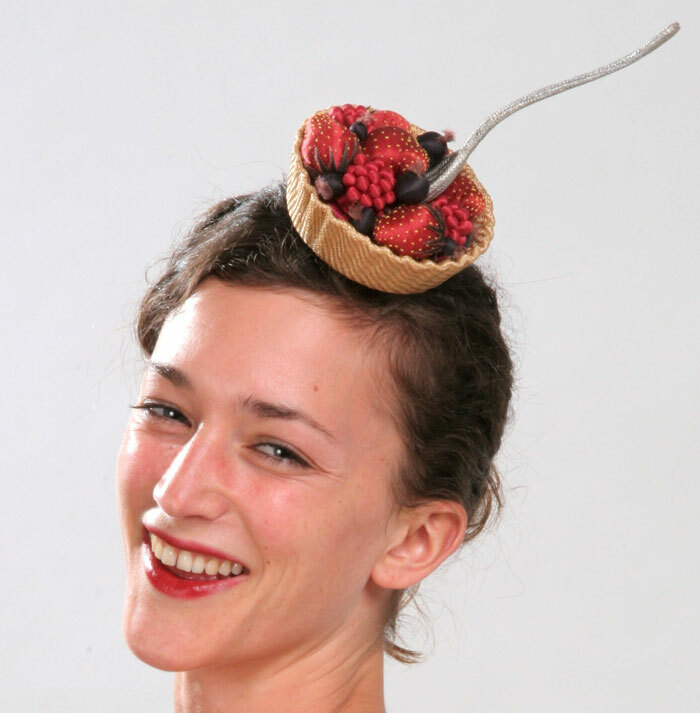 I’ve been a milliner for years now so am quite keen to branch out a bit. I’m currently working on a leather floral sculpture for the Walpole Press Day at Liberty, Commissioned by Ettinger. I’m really enjoying the challenge as they’re using me as a sculptor not a milliner and so I can make something that doesn’t have to be worn. I’m also enjoying using a material – leather – which I haven’t worked with before as I’ve found a way of replicating the carving and scrolling techniques I use in more delicate fabrics in this chunkier material. I’m always wanting to break out and refresh myself as a maker by doing new things – I hate labels and pigeonholes so this is a very liberating project. What made you decide to start teaching? I’ve got a bank of skills that I feel I want to pass on. I’ve spent the last 30 years refining my skills and so have learnt all sorts of techniques which I want to share with others. I want to give them some of the magic I’ve enjoyed. Teaching is quite a new thing for me, and it’s been quite hard to change direction, but it’s a great sense of achievement for me and it’s been really good for me to be forced out of my comfort zone. To work with makers like these visit our events.